The Orphanage of the Sisters of Bethany was established in 1875 for poor children from 2 years old. The Sisters were an Anglican order, founded in London in 1866. 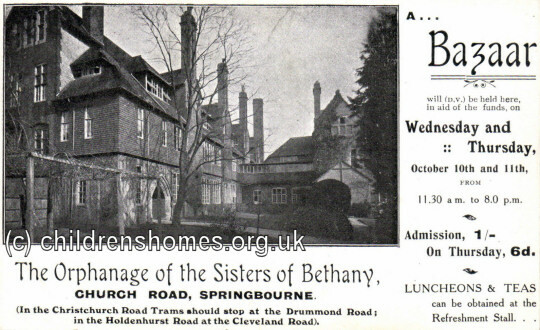 The Orphanage stood on Church Road (now St Clement's Road) in the Springbourne district of Bournemouth. The site also included a convent and a children's hospital. The Orphanage could accommodate up to 100 girls, aged from 2 to 10 years at their time of admission. There was a weekly charge of 5s. plus am entrance fee of £3. 3s. Baptismal and medical certificates were required. The girls were trained for domestic service or other suitable work. An outfit was given on leaving for service. 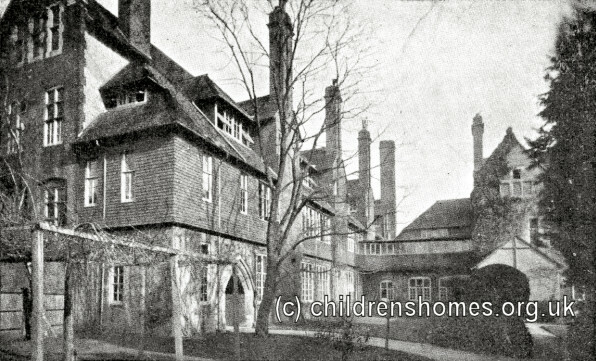 Orphanage of the Sisters of Bethany, Bournemouth, c.1905. Like many children's homes, the Orphanage spent a lot of time raising funds to cover its running costs. As well as income from fees and from laundry work, money-raising events such as bazaars were regularly held. As well as their a basic education, the older girls were trained in housecraft, needlework, laundry and secretarial work. Other activities included dancing and musical training, with the girls winning many prizes at local musical and dance festivals. By the late 1930s, a fall in demand for places led to the building being adapted to provide accommodation for 'retreatants' and other guests. The children's infirmary block became St Gabriel's Convalescent Home for children. During the Second World War, the site received a direct hit and there was extensive damage to the Orphanage block. The building was restored and in 1955, St Gabriel's was converted to receive elderly women who could no longer manage in their own homes. When the Mother House in London closed in 1962, it relocated to the Bournemouth site. The Sisters left Bournemouth in 1986 and are now based at Southsea. The buildings have now been converted to residential use. Former Orphanage of the Sisters of Bethany, Bournemouth. The National Archives, Kew, Richmond, Surrey, TW9 4DU. Has School Files (1895-1910) and a few other files.